While this caused some chuckles around the country, no one batted an eye in the studio, or, I assume, among CBN’s audience, which widely accepts the notion of Trump being God’s man in the White House. 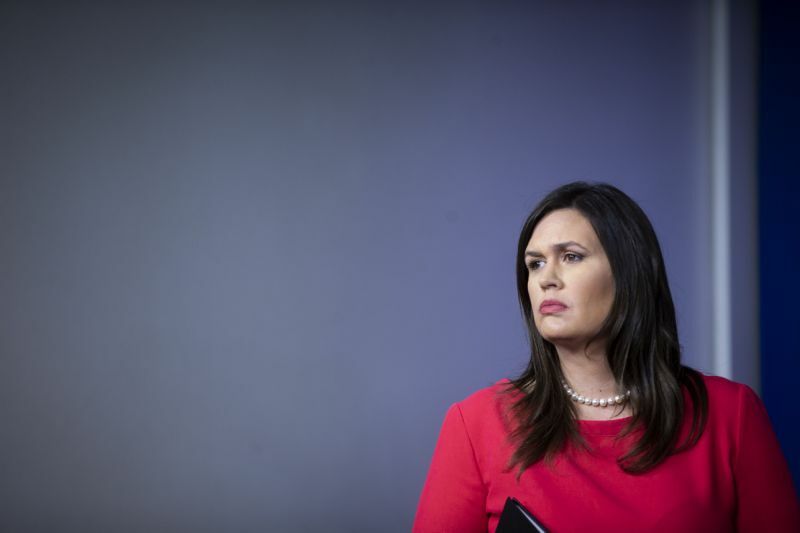 Indeed, the approving hosts set the plate for Sanders by asking her to comment on the idea that Trump was placed in power by God “for such a time as this.” This phrase is a quote from the biblical book of Esther, a story about God raising a young woman to a position of power in order to save the Jews from being eradicated. Within this framework, Trump is seen as a new Esther and embattled white evangelicals and conservative Catholics are the new Israelites, oppressed and facing extinction at the hands of evil liberal oppressors. Everyone on set and most in the audience understood this. They also understand being scared. Fear is the primary characteristic of this theology, grounded in the notion that if someone strong doesn’t take action, all will be lost. As a radio caller told me in the run up to the 2016 election, “If we don’t elect Trump, Christianity will die in this country.” As such, believers prayed earnestly for a Trump victory, and celebrated it as a sign of God’s blessing on them. And if the mild mannered and humble Esther isn’t an exact personality match for President Trump, there’s always the story of King Cyrus to fall back on in support of this narrative. Cyrus was the Persian emperor who allowed exiled Jews to return and rebuild the temple in Isaiah 45. Believers point to the pagan king to argue that God doesn’t have to use paragons of virtue to accomplish his purpose, so he can certainly use Donald Trump. Trump isn’t a new Esther, or even a new Cyrus. I think a case can me made, however, for him being a new Saul, particularly in what the rise of Israel’s first king said about the spiritual state of the people. While I certainly agree that God can use whomever he wants for whatever purpose he wants, and that he has ultimate control over who is in the White House, the “Trump as protector” wing of White American Christianity is drawing exactly the wrong lesson from his rise to power. The people called for a strong worldly ruler to counter all the strong world rulers around them. Specifically, they saw Nahash, King of the Ammonites, getting ready to attack and they got scared. (1 Sam 12:12) As with today’s Christians, fear was the primary motivator. The rise of Saul to power was a sign of the people’s relationship with God, but it wasn’t a sign of health. Rather, it revealed that the people were far from God. It revealed that the people were idolaters who had rejected faith in their Creator. And the fact that God allowed Saul to take the throne was not an act of blessing. Rather, it was an act of judgement intended to chasten. The subsequent reign of Saul ushered in all the devastating consequences that God had warned it would. Today, White Christian America celebrates President Trump as a sign of God’s favor and protection upon them. I submit that it is actually a sign of their own idolatry and wickedness and that rather than celebrate, they should take it as a call to repentance.